If you’re not a fan of prepaid carrier Metro by T-Mobile, don’t have a number to port in, or just hate free stuff, but love tiny handsets with reasonable amounts of processing power, we have some terrific news for you... for the third time in under two weeks. 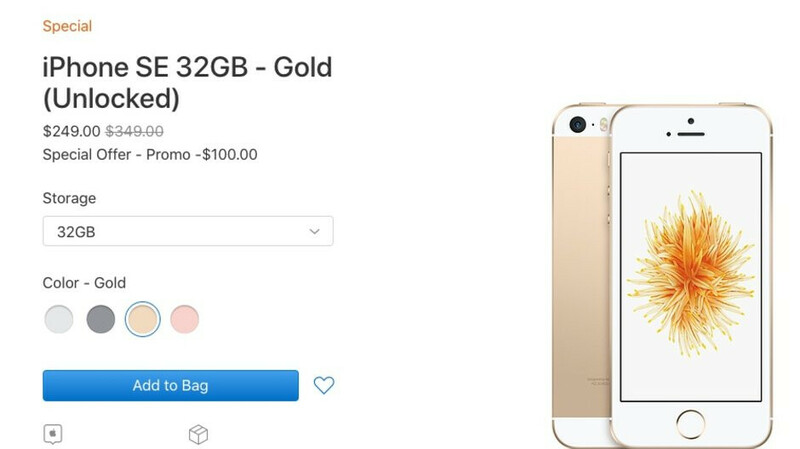 The US online Apple Store’s “clearance” section lists the iPhone SE as available for nationwide shipping or in-person pickup yet again, starting at the same discounted price of $249. That’s down from $349 back before the 4-incher was formally discontinued in September, including 32 gigs of internal, non-expandable storage space. At the time of this writing, the entry-level configuration can be purchased in your choice of gold or rose gold, while the $299 variant with 128GB local digital hoarding room (reduced from $449) is up for grabs in gold, rose gold, and silver paint jobs. Across the board, you’re looking at brand-new, unopened, unlocked, SIM-free units, compatible with both GSM (AT&T and T-Mobile) and CDMA networks (Sprint and Verizon), although warranty information is notably absent from the revived handset’s details section. Almost three years after its commercial debut, the iPhone SE remains one of the world’s best ultra-compact smartphones, weighing in at a measly 113 grams with a premium glass-and-metal body measuring 7.6 mm in thickness. Fully eligible for an iOS 12 upgrade, the Apple A9-powered device comes with a retro Touch ID fingerprint sensor, Apple Pay support, a single 12MP rear-facing camera, and yes, a headphone jack. It’s pretty obvious why there might still be demand for this diminutive product, but various recent prepaid deals make the $249 unlocked price tag somewhat hard to swallow. That being said, we fully expect Apple to sell out of the iPhone SE again in a matter of hours. Dam these things keep cropping up from the dead. Take those dam little excuses of a smartphone out back, and shoot it. Put it down already. Tell you Apple test you water, do everything they can to grow revenue, i think Apple learn something here $1000 phone probably a mishap. Iphone XSE more likely is coming. iPhone sales are that bad?